Organised by Giancarlo Frosio and Estelle Derclaye, School of Law, University of Nottingham and funded by CREATe, this workshop attempted to gather the different stakeholders in the field of open access publishing, especially open academic publishing, with the double aim of presenting the research gaps identified in Open Access Publishing: A Literature Review and eliciting reactions, comments, criticisms and finding new research questions and areas to explore both theoretically and empirically. With thanks to Mike Beard, photographer at University of Nottingham. 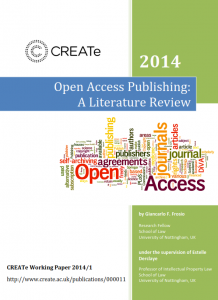 Available as CREATe Working Paper 2014/1, Open Access Publishing: A Literature Review by Giancarlo Frosio under the supervision of Estelle Derclaye provided a backdrop to the day’s discussion. The literature review was undertaken to ‘investigate the current trends, advantages, disadvantages, problems and solutions, opportunities and barriers in Open Access Publishing (OAP), and in particular Open Access (OA) academic publishing’. It could be neither fully comprehensive nor completely exhaustive. However, it did draw from a considerable breadth of inter-disciplinary sources (legal, economic and academic) as it is aimed at an inter-disciplinary audience and advocates inter-disciplinary solutions. It has identified four major Research Gap areas each with a number of sub-research topics. These are presented with a view to assist researchers and stakeholders frame investigations, studies, assessments, policies and new business models. The Review also seeks to invite elaboration on the identified Research Gaps and to stimulate the sharing of additional Gaps. Ken Wilson, Doctoral Researcher at University of Nottingham’s School of Law has written a summary account of the workshop, which can be found on CREATe’s Blog. Caveat: The research gaps below have been suggested by experts in the area. Some gaps are generally stated in broad terms and thus have been partly investigated. This list is by no means exhaustive and CREATe has not checked it against the very comprehensive literature in the field of OA. The library community and OA. The reading public and OA. The history of the Open Access movement. Assessment of Open Access models that are limited to specific research communities. Assessment of the degree to which Universities and scholarly authors subsidised the publishing industry. How publishing markets form and develop. The effect of the range of Creative Commons licences suite from a publisher’s perspective. How competitive a fully OA publishing model would be. The effect of Green OA. The extent and economic effect of any possible ‘double dipping’, including clear definitions of the concepts of double–dipping and double payment, the difference between the two. The cultural and academic issues around scholar-led publishing. Alternative business models to APCs such as price-fixing and external regulation. The real costs (and the need for them) of APCs. The assessment of the value of the different elements of publishing.